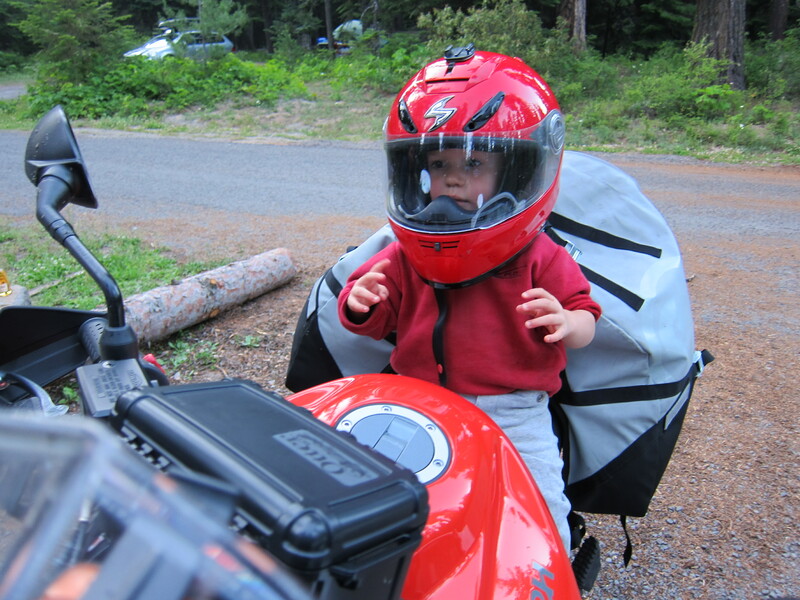 When I moved to Oregon in 2005, besides Oregon being such a riders paradise, the primary motive for the move were my close friends of many many years who had grown up in Oregon. We were all in Ohio at some point, and we all moved to Oregon in 2005. From OH to OR. For me, since I used to work at The Ohio State and now work for the University of Oregon, it was also from Bucks to Ducks. Every year we organize a camping trip somewhere. 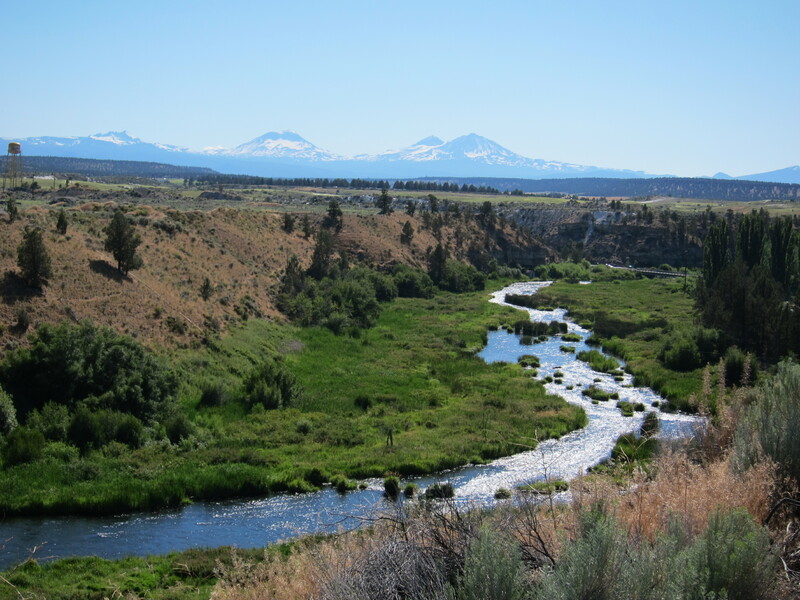 Last year it was at the Metolius river, documented on this site. 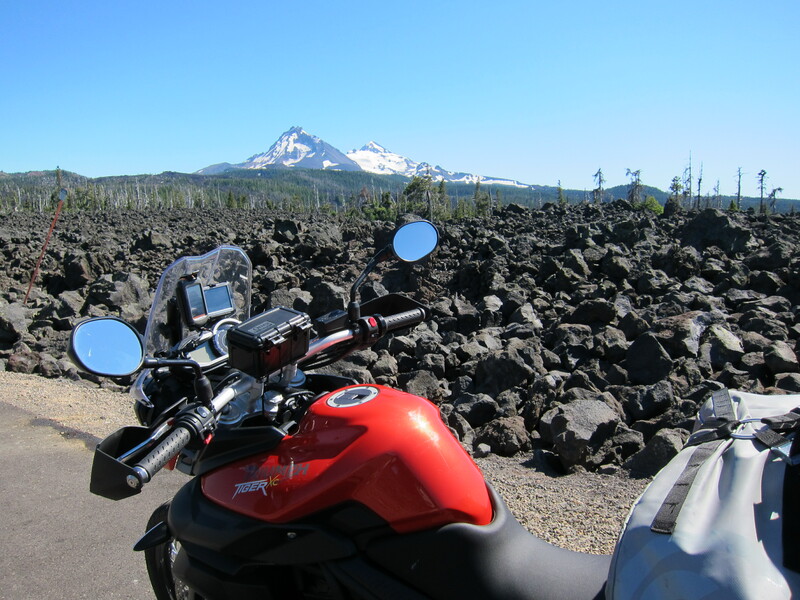 This year, Mt Hood. 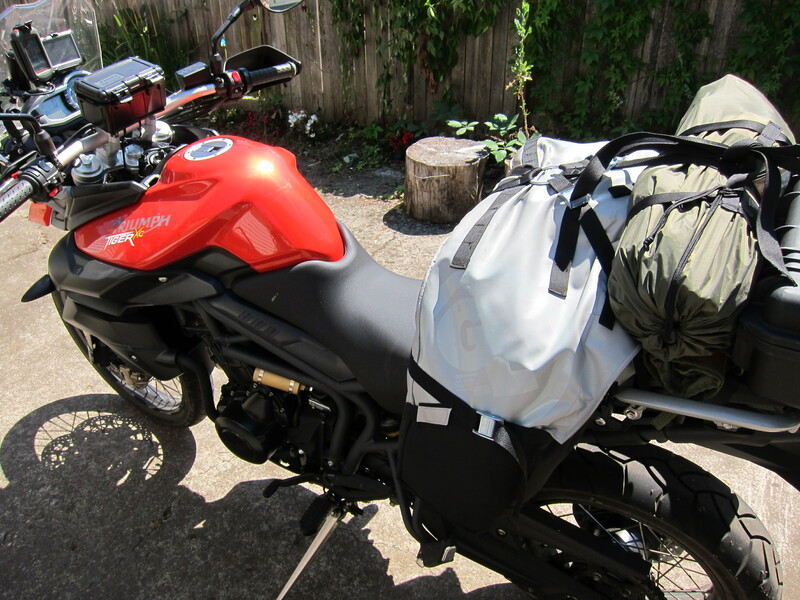 I packed the Tiger for the trip. It would be a one night camping trip for me. I packed dinner and beer. 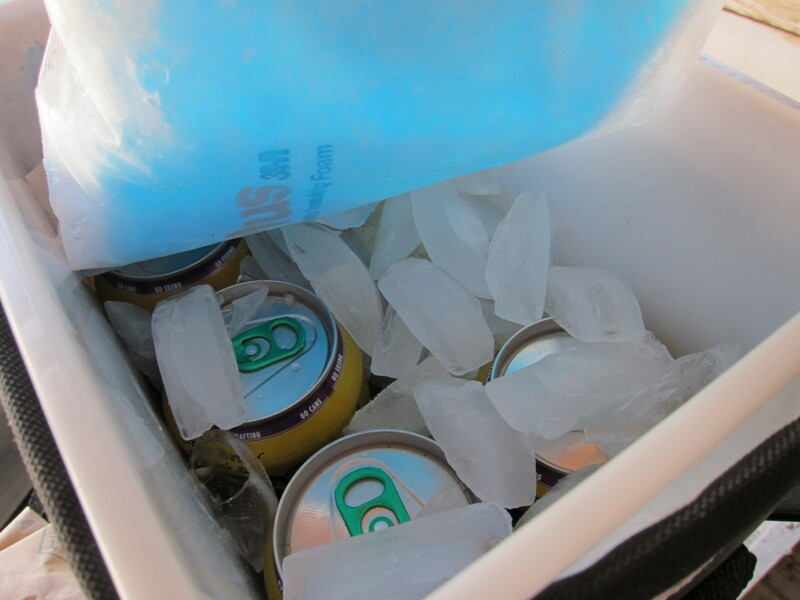 I was amazed that my small cooler fits on the small compartment in the Great Basin. 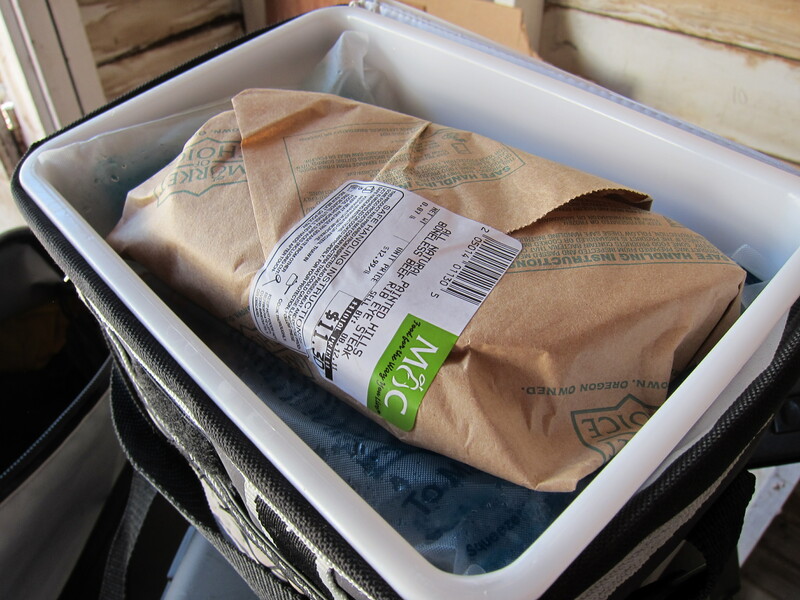 I had beer, steak, and a container with potato salad plus ice safely packed. And the steak on top. 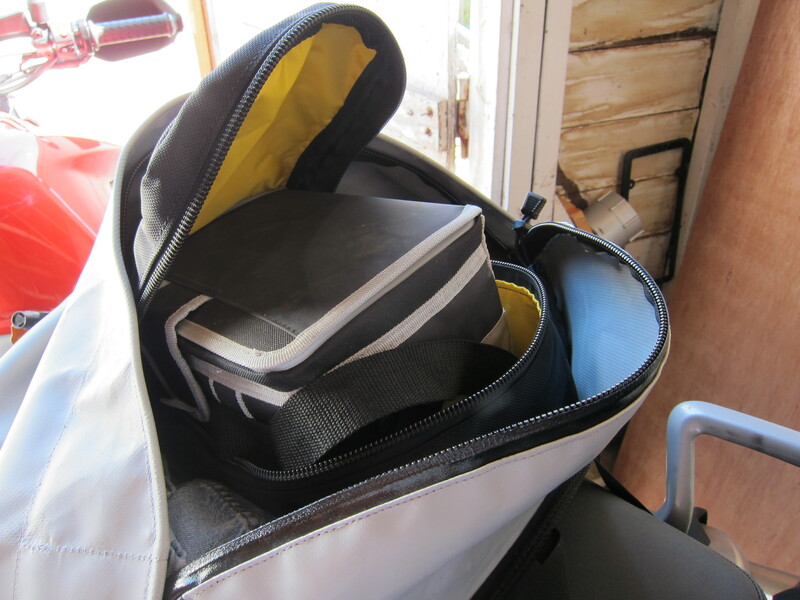 Cooler inside Great Basin bag. Ready to go. August 2011. I took my usual route east. When 242 is open, that is my way to go. Getting the blessing from the Three Sisters. They followed me along as I started to go north. Oregon is an incredible state. I’m constantly reminded of its beauty. From there no more pictures until I got to the campground, 8-mile crossing campground on the east side of Mt. Hood. Distance from home, 225 miles (360 miles). This little fella wanted to ride my bike. I said: sure. But the handle bars were too far. Maybe in 15 years from now. I cooked my stake, had my Caldera IPA (surprisingly good). All was good. Good night of sleep. 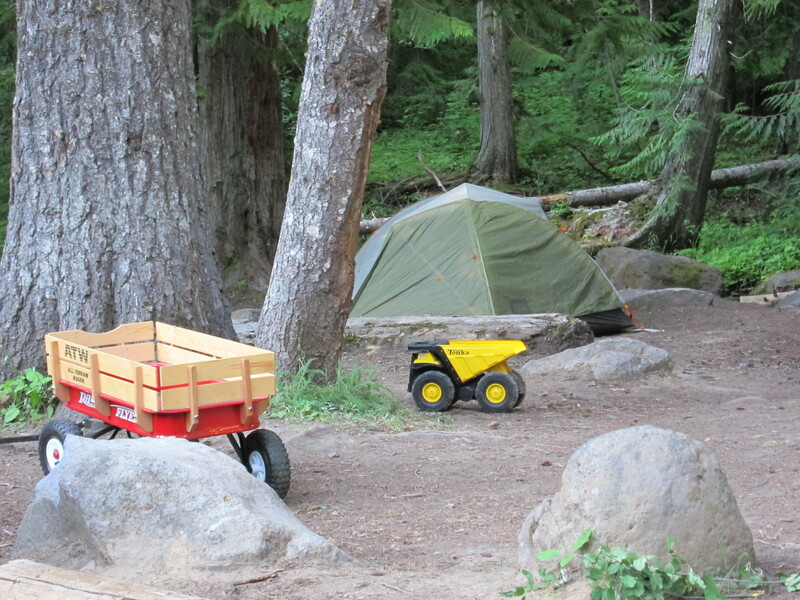 My tent, behind the Tonka truck. The water “feature” behind my tent. 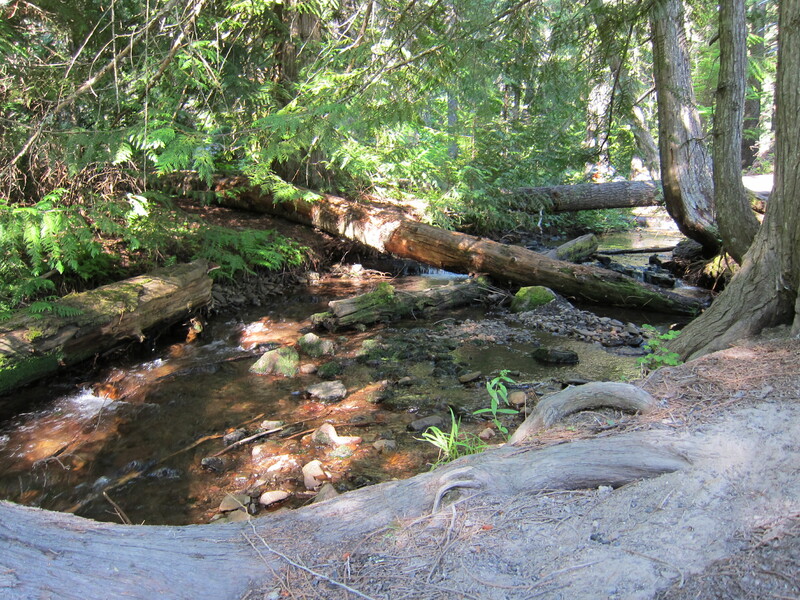 The creek. Garanteed great night of sleep. 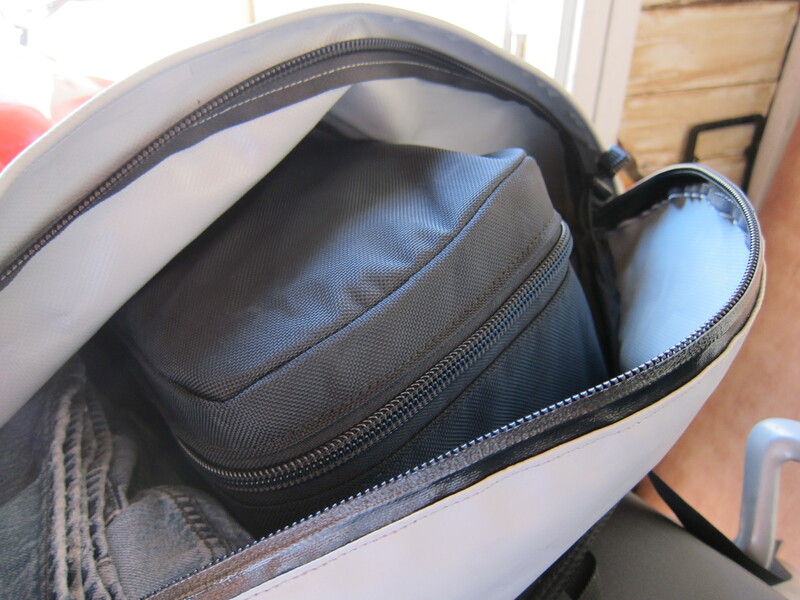 I had a great breakfast with my friends and I was packed and ready to go. I decided to go on a long counter-clock circle around Mt. Hood. I started by going east, then I would turn north, cross the Columbus river and ride east towards Portland and then go south to Eugene. The direction I was going. 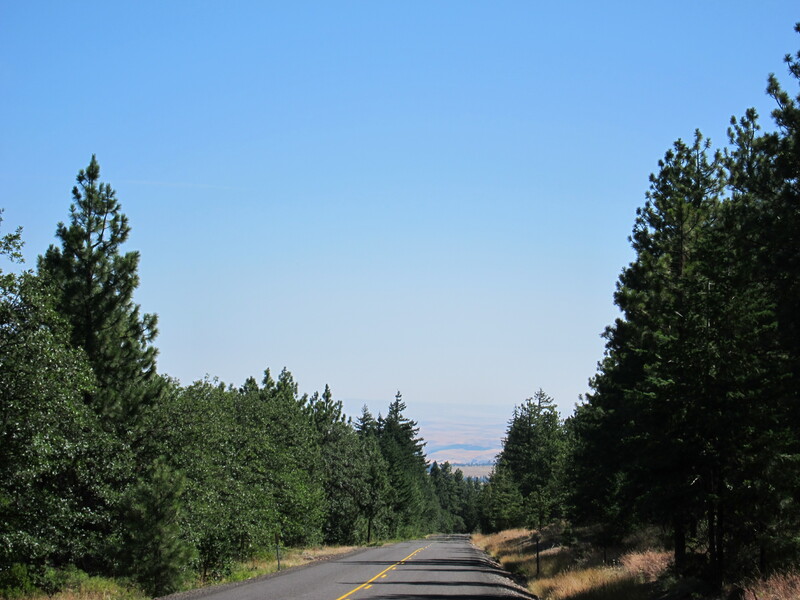 Now going north, I will cross the Columbia river (it is somewhere ahead). More wheat. 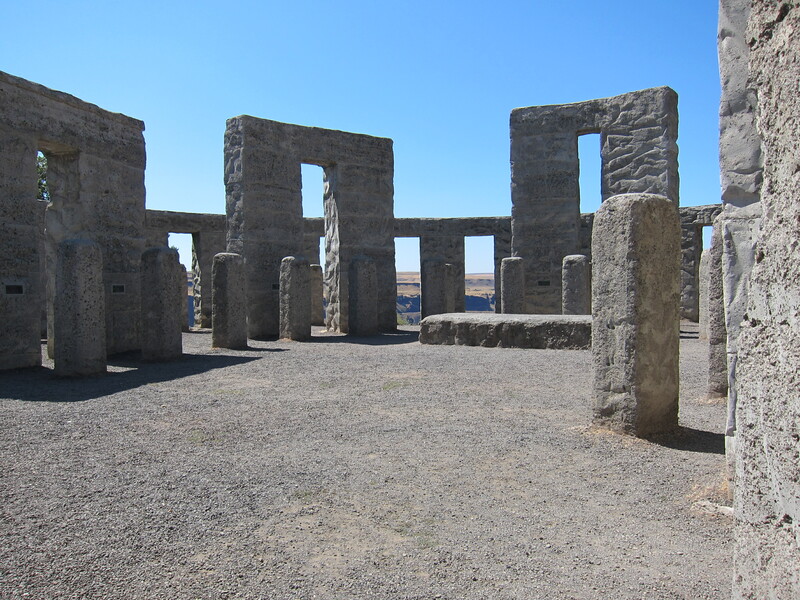 Already on the Washington side of the river, I checked this 1/2 scale replica of the Stone Henge. 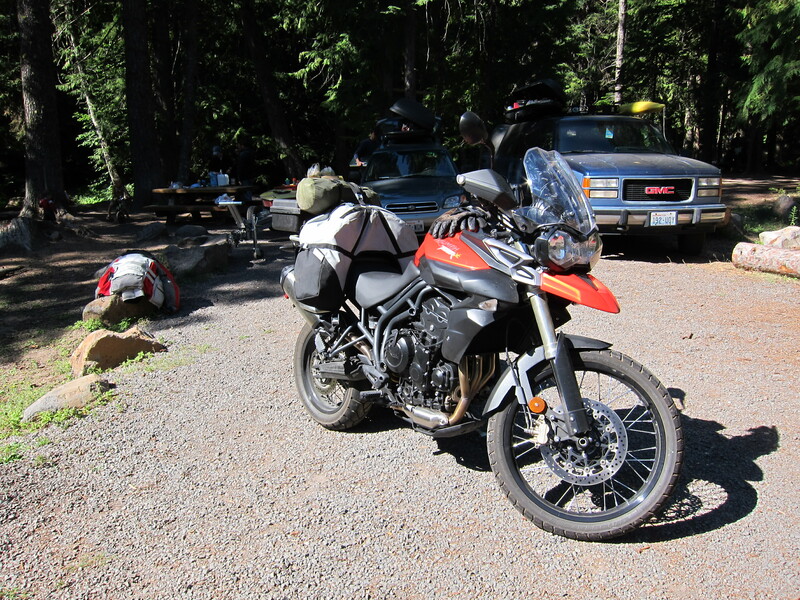 Yes, I was still riding this beautiful Tiger. Stone Henge replica. WA. August 2011. The wind coming from the west channels through the Columbia river gorge. It was really windy here, it is always windy here. And on both sides of the gorge you will find wind mills. Hundreds of them. 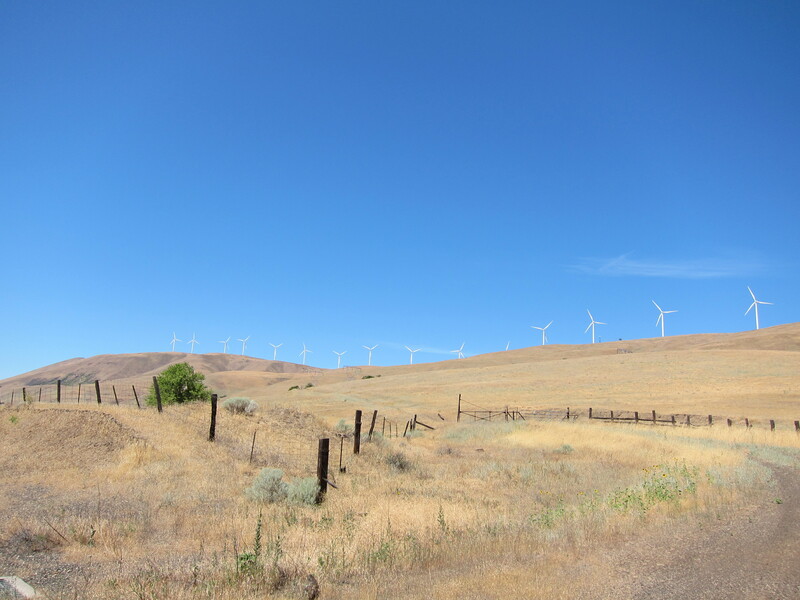 Windmills on the Columbia Gorge. Washington, August 2011. 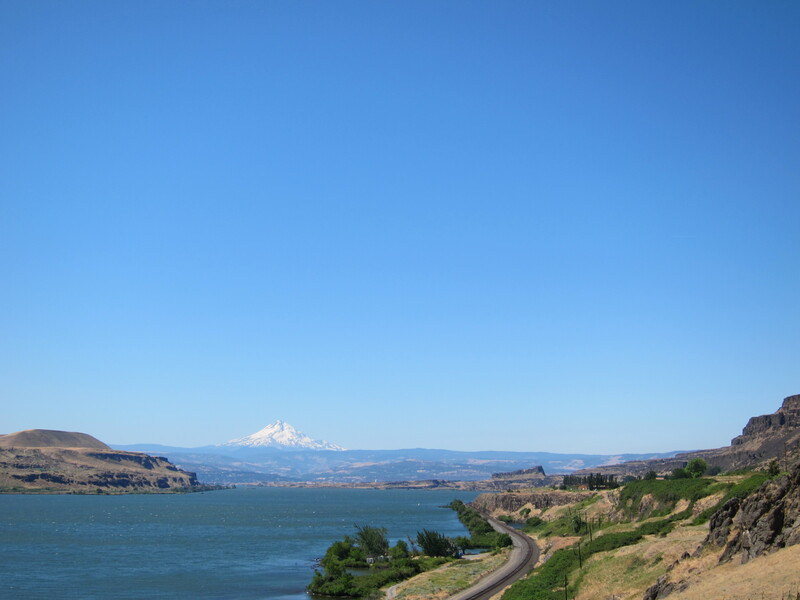 And here is a view of the Columbia river, with Mt. Hood on the background. I was now traveling west on the north bank, Washington side of the river. 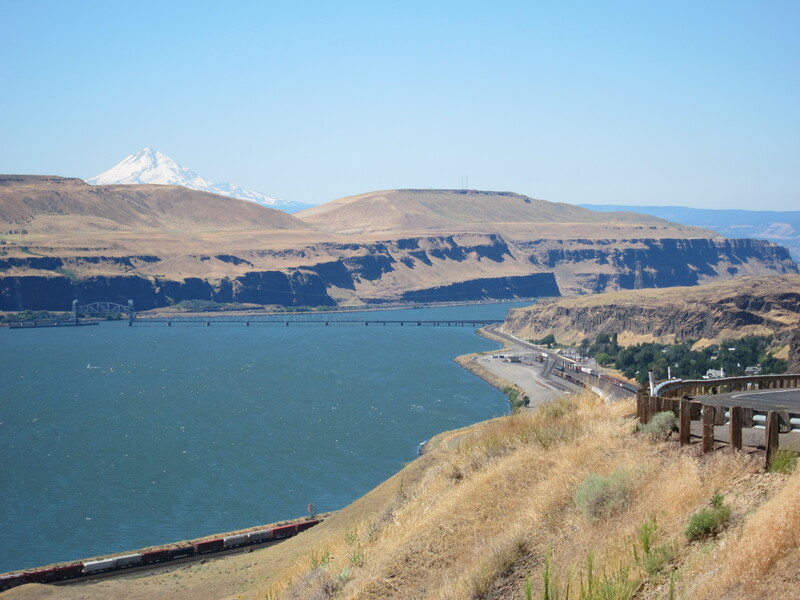 The Columbia River. View from the Washington side. August 2011. A close up of that same view. You can see the whitecaps on the river. This is one of the prime locations for windsurfing and kite surfing in the world. Further ahead I passed by an area that was crowded by wind surfers and kite surfers. Traveling west, desert views are gradually taken over by green. 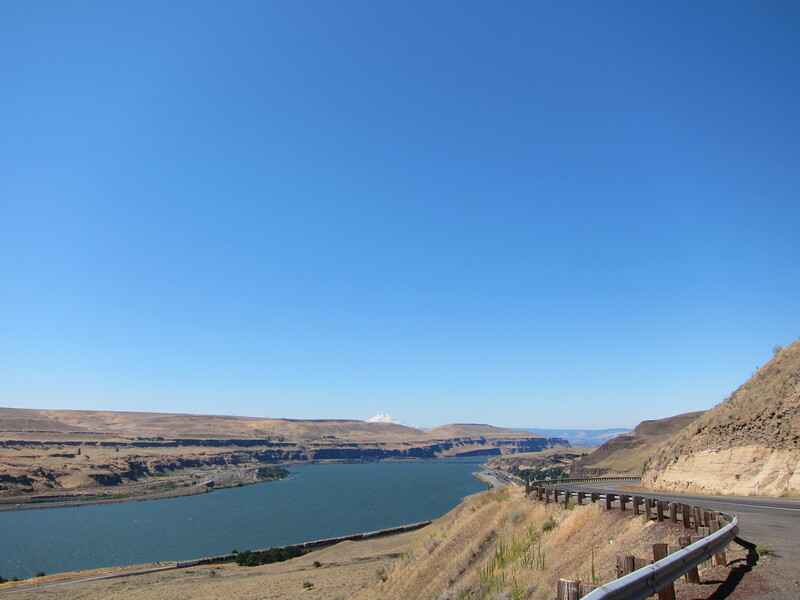 Columbia River, view from the Washington side. August 2011. Finally I arrived to the point where the wind was the strongest. Wind surfers and kite surfers were everywhere. Windsurfers paradise. Columbia River, Washington view. August 2011. 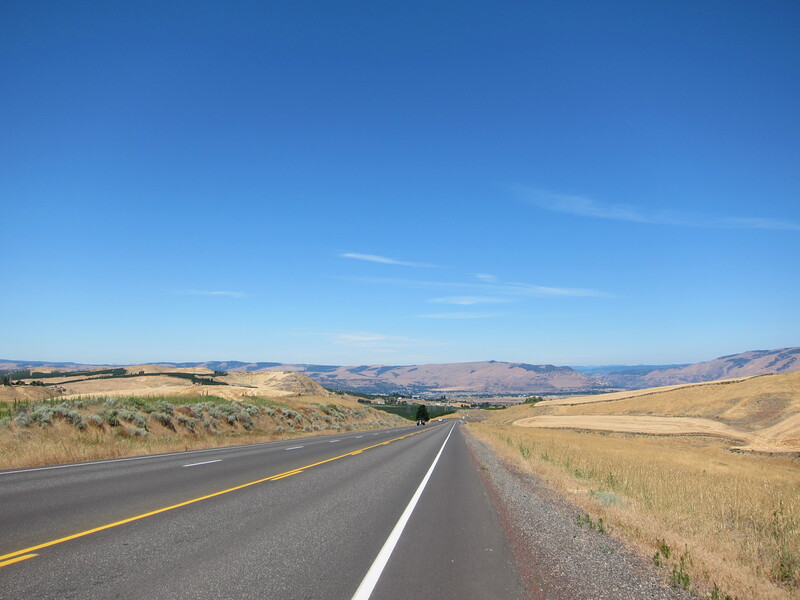 I continued west until Portland, where I crossed the Columbia river and then the Willamette river. 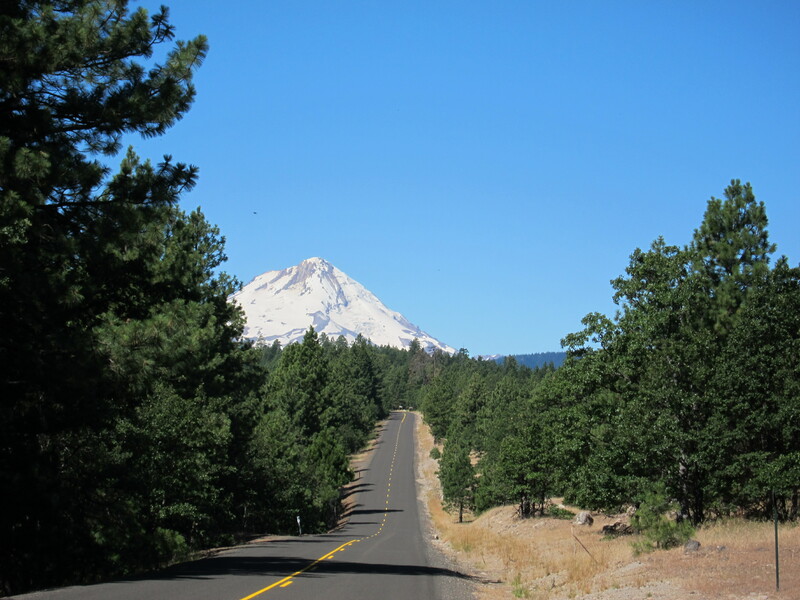 To avoid Interstate 5, I found the back roads that travel south, parallel to Interstate 5. 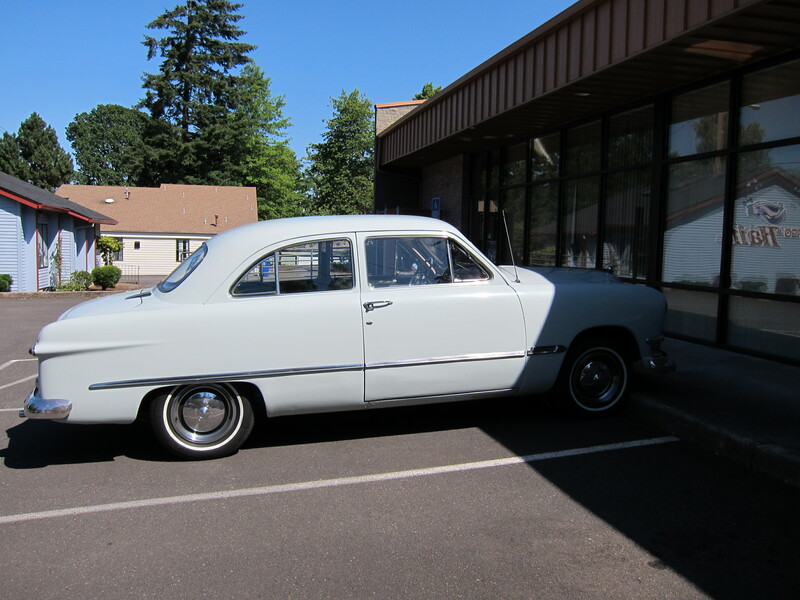 Going through the suburbs of Portland and small towns along the way I found this Ford Custom. My grandfather once had one this these cars. A four-door, but on this very color. Ford Custom, circa 1952. Oregon. August 2011. Last view of the Mt Hood for this trip. 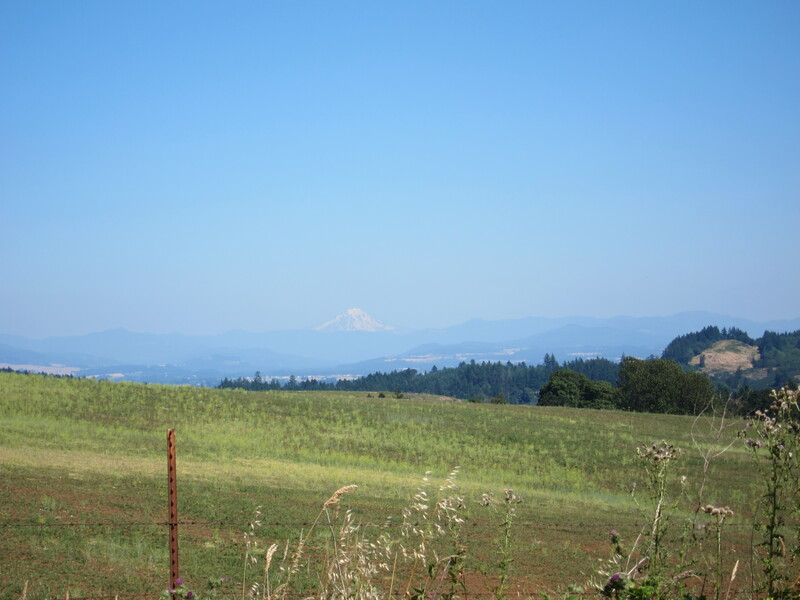 I was now traveling south on the Willamette valley. 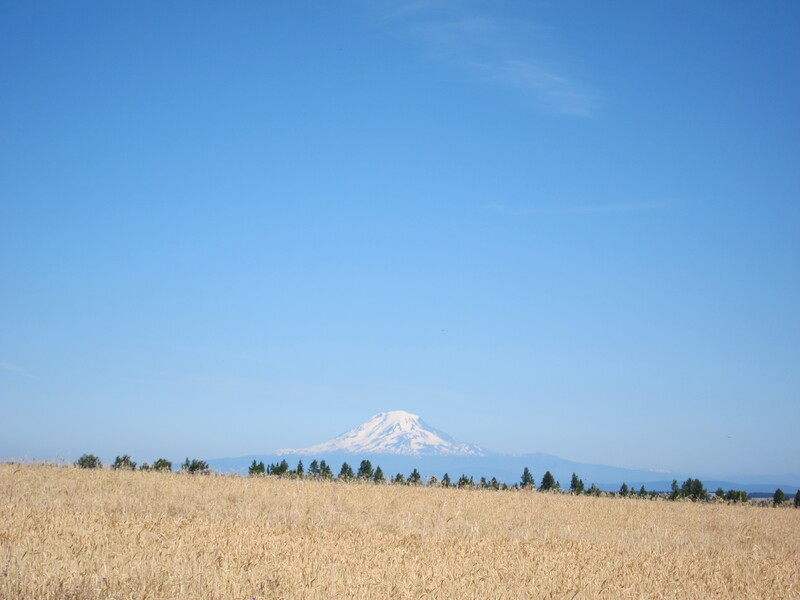 Mt Hood as viewed from the north of the Willamette valley. Oregon, August 2011. 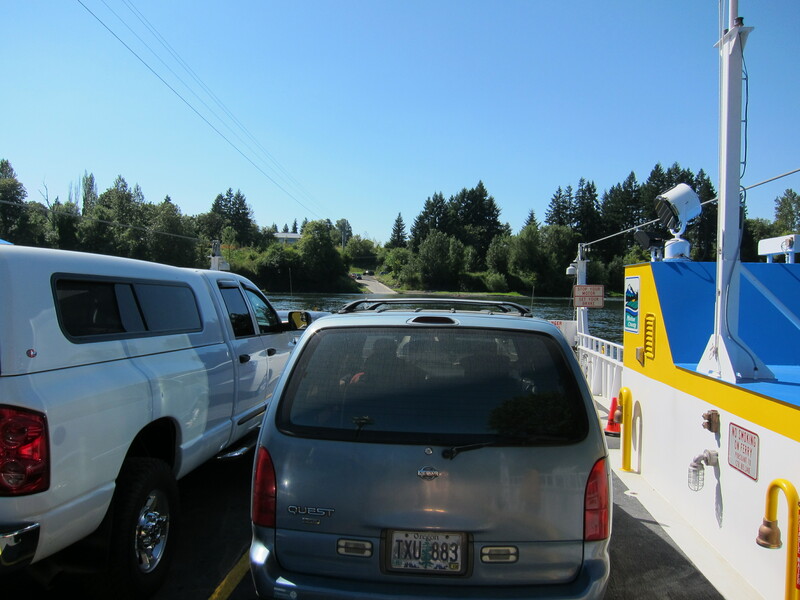 I was surprised that at some point I had to cross the Willamette river via a ferry boat. This is the Buena Vista ferry boat. I would come back to explore it some more on another trip. 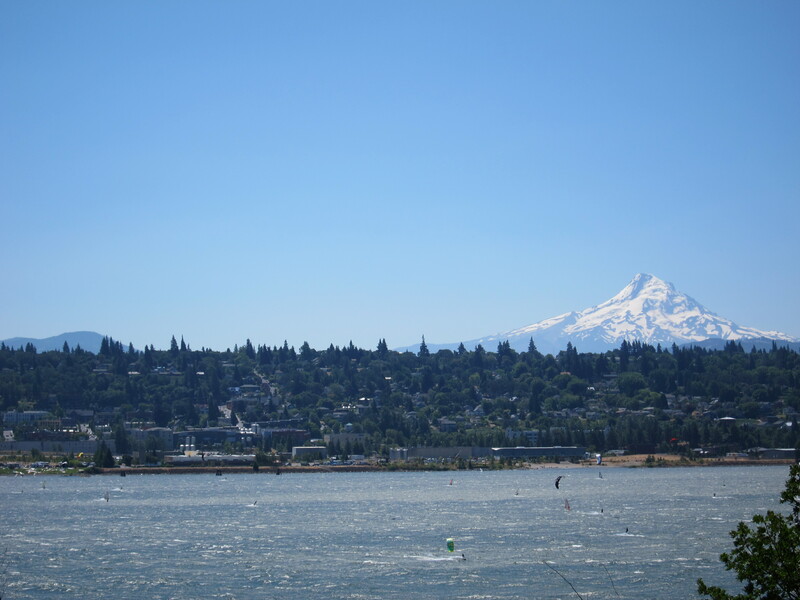 By the way, the Willamette river is the river that coming from the Cascades, run through Eugene, just a block from my house before turning north and connecting with the Columbia river in Portland. Buena Vista Ferry boat. Crossing the Columbia River. Oregon, August 2011. 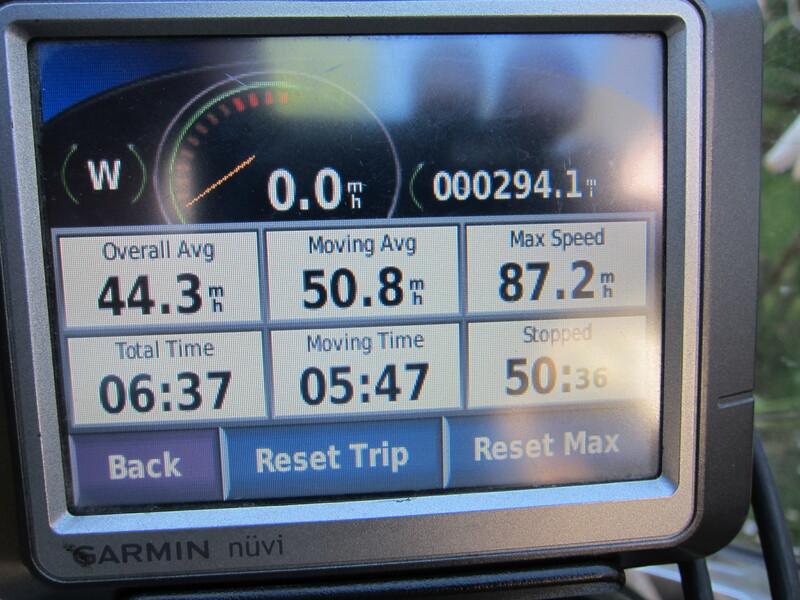 Stats on the way north to the campsite in the Mt Hood area. 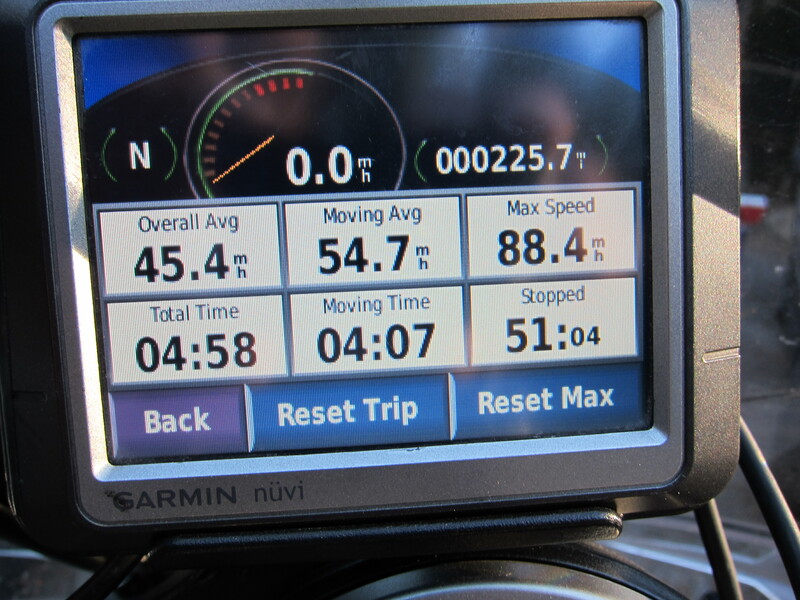 Total for this weekend trip: 519.8 miles (831 km). 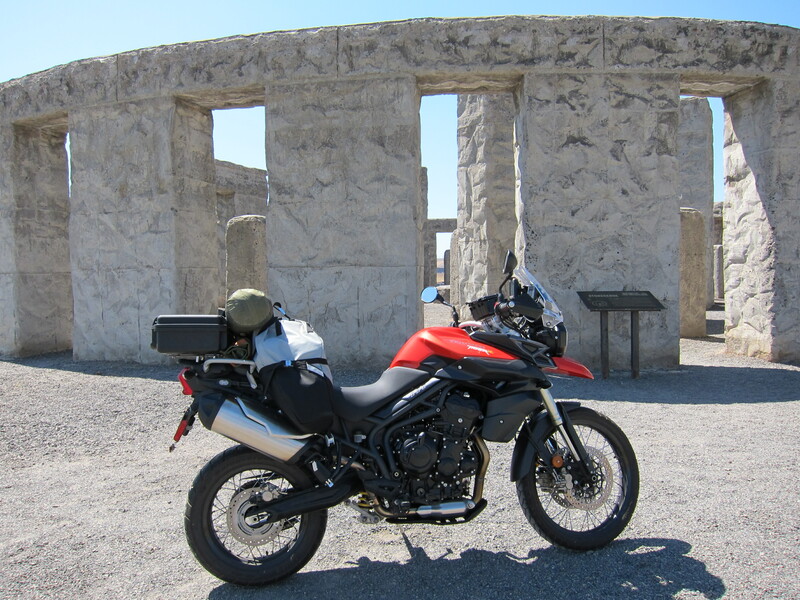 This entry was posted in Riding the Triumph. Bookmark the permalink.